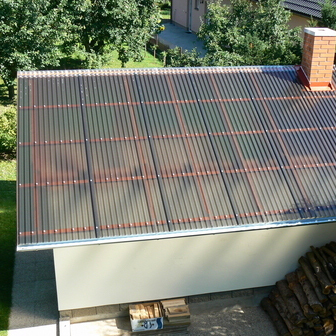 Bronze Corolite corrugated polycarbonate sheet provides advanced solar control with a light transmission of 32%. It is a high performance rooflight material with UV protection for long-term weatherability. With an impact resistance 200 times stronger than glass the robust yet lightweight nature of the product makes it ideal for a range of roofing applications where less resilient rooflight materials are not an option. Bronze is a solar controlling tint with a light transmission of 32%.